Your job: Be interesting. Researcher and author Laurel Braitman explains. 1. Wear a costume (or something shiny, or just a funny hat). A docent at the Bronx Zoo in New York is convinced that the gorillas’ favorite day is Halloween, because hundreds of people visit wearing costumes and this seems to bring all the apes to the glass to marvel at the sights. But you don’t have to be in full costume — even a weird hat or a shiny outfit can inspire another animal to come check you out. 2. Bring a baby or a small child. This is probably the biggest no-fail tip. I’m not sure why so many animals are interested in little kids, but it’s probably because their movements are more surprising and they’re more likely to be playful. Some baby gorillas can play peekaboo, and I’ve had penguins swim along when I run back and forth with toddlers and the birds in interspecies races. Sometimes, of course, the animals are interested simply because a baby looks like a good snack. 3. Slip a harmonica or a kazoo into your bag. It’s incredible how many animals enjoy music. I often bring musicians to play for captive animals — Black Prairie playing for wolves at a sanctuary in Washington State or Grass Widow playing surf rock for a group of Boston zoo gorillas. But you don’t need a full band. Even a harmonica or some respectful percussion might intrigue an animal who otherwise doesn’t get to hear much besides intercom announcements or the din of the public. 4. Act like a circus performer (even a bad one). The easiest way to be interesting is to be willing to look silly in public. It’s very effective. Turn cartwheels or do headstands in front of animals, juggle brightly colored objects (like citrus fruit), somersault across the floor, take off your shoes and wiggle your bare toes (gorillas in particular seem to like this one), or pull things out of your bag, one by one, with a flourish. Any movement outside the norm for visitors is likely to perk up the animals, and if it startles them, it’s not the end of the world. Most of the time they can simply wander away. 5. Hold up picture books or back issues of National Geographic or, if it’s not too loud or annoying, show them videos on your phone. 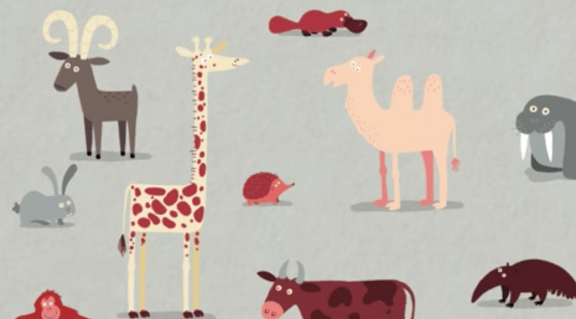 Art credit: TED-Ed Lesson: The three different ways mammals give birth. Author bio: Laurel Braitman is an author, historian and anthropologist of science. She holds a PhD in science, technology and society from MIT. The paperback edition of Animal Madness by Laurel Braitman is available now. Can we manage to make the animals feel so much at home that from their viewpoint we are the ones being imprisoned? OR you could read the signs and learn something about the animals and how to protect them. This is a horribly misguided article and these are NOT things you should do at a zoo. In fact some animals may be scared or frightened by these things. This is their home and we need to respect that. Just because you see a zookeeper do something with an animal remember they have had layers of approval and education to do everything they do with the animals. Leave the enriching up to the professionals. Your job as a guest is to be respectful and learn about these amazing animals and what we need to do to protect their native habitats. This really isn’t what animals, or their keepers and trainers, want to see at a zoo. She should have mentioned asking the keepers about safety protocols and individual animals’ reactions. A few of our parrots are terrified of big hats. Certain noises can be extremely threatening or annoying to a lot of animals. For example, a lot of coatimundis greatly dislike the sound of car keys being jingled. Also, I wonder why a snack-sized human is appealing to large predators. Perhaps a better way to be more entertaining at a zoo is by asking the keepers if you can donate enrichment to certain animals and then asking if you can watch when it’s put out. Keepers and trainers can make enrichment out of lots of everyday items, so just ask what your favorite animals might be interested in. Or tell one of the keepers that you have things like kids toys, old perfume or non-toxic house plants that you want to get rid of. This is a nice way for you to contribute, be entertaining AND be entertained! Albeit well-intentioned, most of these suggestions could actually frighten or disturb an animal. The best way to contribute to an animals’ entertainment at the zoo is by finding out what kinds of enrichment items keepers would like to provide. You may be surprised by how many household items can be reused for zoo animals. Every animal is unique in what they enjoy or what they may really not care for. Children will definitely always catch the attention of many animals, and that is because they are prey-sized, most fast, and make funny sounds. It is best to not *tease* an animal with somrthing they cant actually get. Thank you for thinking of the animals but please communicate with your local zookeepers to find out the best ways to provide for their animals. I would be very careful of doing any of those things. Some animals actually would be terrified. Giraffe are highly sensitive and surprisingly enough, so are big cats. I have had perfectly nice viewings by wearing safari colors and nice perfume. I stand quietly and wait for the animals to approach me. I also go on days when you will have fewer visitors. Animals can be totally overwhelmed by visitors on busy days. On a dampish day when there are fewer visitors the animals will be more likely to approach you. For heavens sake if you want to do anything unusual at the zoo, please talk with a keeper first. A lot of zoos are happy to have common house-hold items to make into things to entertain the animals. Ask what the zoo could use and ask if you can watch when they put those things out. As a zookeeper this is absolutely the opposite of what we want patrons to do while visiting our animals. All of these things would disturb/frighten/torture most species. Very misguided article, please do not do any of these things at any zoo you may visit.